Walking a winding road downward, we pulled over for coffee at an outdoor table. High on a ledge, the height along the cliff felt staggering. There were colorful, sweet scented flowers growing along the building walls on the far side of the street. We sat at a table just above the drop down to the sea. The sky was blue and the sea was bluer. The waves were visible with spots of white in their movement. 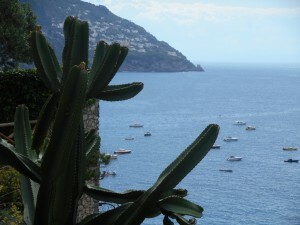 We had just come from a harrowing bus ride from Sorrento to Positano. The winding roads along the mountainside were all right, but getting on the right bus and getting off at the right stop was fretful. On our last full day in Italy, we were determined to take in some of the Amalfi Coast, that spy movie destination with a chic sounding name. Positano is known as the prettiest town on the Amalfi Coast. We walked downward by roadside shrines and on sidewalks that curved and led to a choice of narrow staircases. The straight staircase was a bit boring so we went back up and tried the other one. Down, down, down. There weren’t any exits so at least we didn’t feel lost. Then we came to a road and had to walk through a tunnel. At that point, I cornered a person to ask how to get to the beach. The response was in English; we were in tourist territory. We took our directions and kept walking down stairs and around what seemed to be private places. Then the stairs became taller and we walked toward an opening with a bunch of rocks. We had reached the seashore. We sat on boulders and admired the day. Before being hypnotized by the waves, we got up to set off for more exploring. We walked about the market area. And wonder of wonders, we got ferry tickets to return to Sorrento. (I say that because the ferry schedule for that route is a well-kept secret.) We stopped to enjoy a glass of limoncello and got some souvenir bottles to take home. After some time of sitting in the sand and admiring the waves, we got our feet wet in the waves. Just to make sure we got more than our feet wet, a huge wave hit the ferry while we were boarding. (The ocean is in control whether we know it or not.) We spent about an hour on the water cruising past colorful mountainsides. It was a brief jaunt but I came away feeling I had experienced the Amalfi Coast. Why not make the last day count?